Expert tip: This is one of the most popular yoga retreats offered in the USA. Our teacher training meets the standards of Yoga Alliance and will prepare you with all of the knowledge and experience you will need to confidently begin your teaching journey upon completion. We keep our groups small and intimate to give you all of the attention and support you will need, present, and future. With over 20 years of teaching experience, our instructors are ready to support you where you are at and excited to assist you in your highest calling to service. Our programs are rooted in love, support, and proven methods of success! Stay out on 40 peaceful, serene acres with a beautiful view of Mount Hood, the house is furnished with everything you will need with full kitchen, laundry, and full home or land access. The following subjects will be taught and studied in this teacher training course. Upon completion, you will be able to understand the importance and value while integrating these into your teaching knowledgeably and successfully. Shannon began her yoga journey in 2003. Her love for Bikram yoga accelerated her undeniable calling to become an instructor. 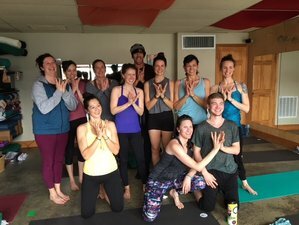 She completed her 500-hour training at BYCI Headquarters in 2004 to eventually begin the process of pursuing her wildest dream of opening the first yoga studio in her most cherished community of The Dalles, Oregon. She later went on to open a second studio in Hood River. Today she has a variety of certifications in many different styles, has started a non-profit kids yoga program in schools & also enjoys teaching at Google, the local jail, schools & both of her studios. Transportation to all training locations, store, etc. A reservation requires a deposit of 18% of the total price. Rooted in building and growing community from the inside out, Pure Yoga meets you where you are! Share in breath and movement fostered in love and support.